I bought two 44 tile sets. They are really well constructed and engineered. My son loves them. 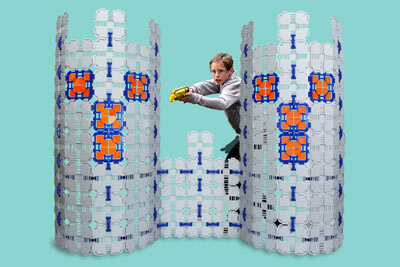 Great for forts, making barricades for nerf wars and anything else your child can imagine. Highly recommend for fort building fun. Bought a starter set and then added this set as well! What kid doesn't like building a fort and having a little place to hide out and be in their own world? I have two daughters (6 & 10) and they love these so much we needed more! Great design makes them simple and easy to use - just click them together and make a structure! My six year-old has no problem building with them on her own and is so proud of her creations. We had previously bought a different brand of fort building kit with sticks and connectors, but this is superior in strength and stability. As a bonus it doesn't require a sheet or blanket unless they want extra ambiance! The product is terrific! My two grandsons ages 3-1/2 and 6 both enjoy playing together and have come up with very creative structures! My 5 year old son loves building and all things construction. He loves these fort boards and keeps asking for more sets to build bigger things. He is able to build by himself, but it is fun for adults to join him also. Highly recommended. I purchased one set of these for Christmas for my 4 yr old. She is able to help me follow the patterns and snap the tiles together, although she is still too young to use the connectors. She loves building with them and the finished forts, and I love that they break down into such a small box. It's a toy she will continue to grow into and will use for years to come, which is important to me. We will be purchasing more sets in the coming years. Bought 4 sets of these for grandkids. They love them. Hours of fun!! Breaks down into a small space. My 11 year old uses them for nerf gun wars.